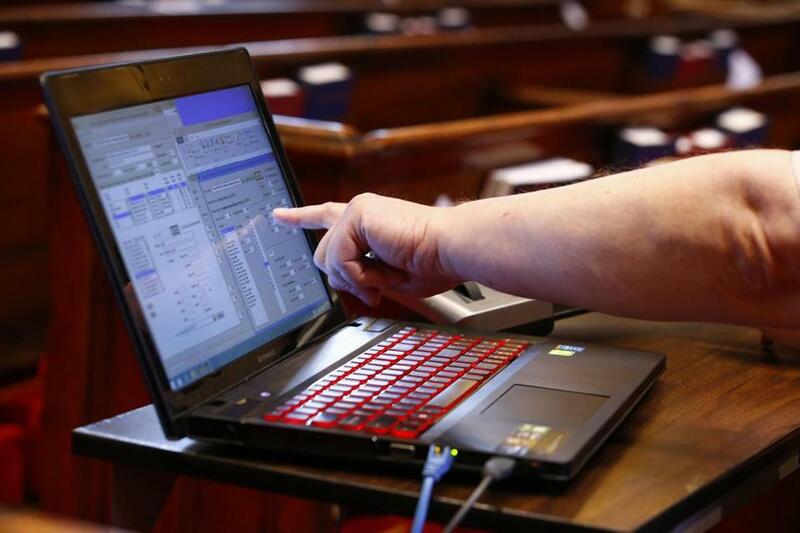 Doug Marshall played the new digital organ after tuning and adding samples at St. Matthew’s Church in Wheeling, W.Va.
WHEELING, W.V. — Doug Marshall wasn’t thrilled with what he heard. 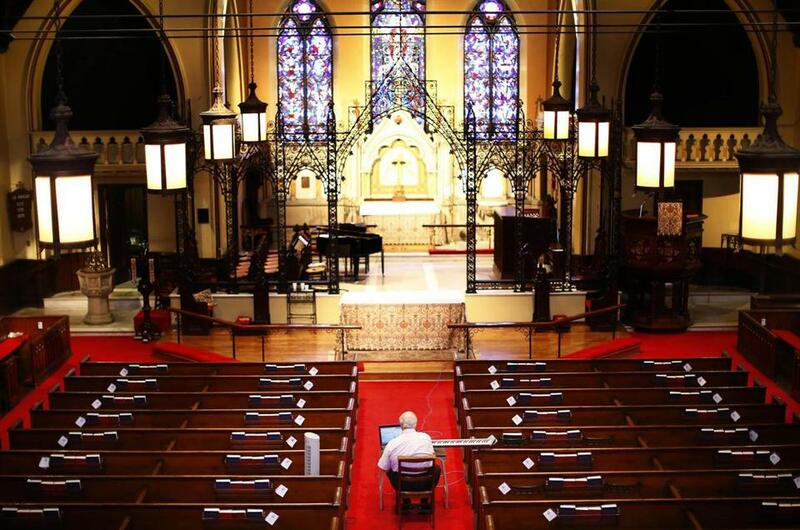 Seated at a makeshift desk at St. Matthew’s Episcopal Church, the organ maker ascended the keys of a plastic keyboard he’d propped on a pew to his side. A laptop glowed before him. 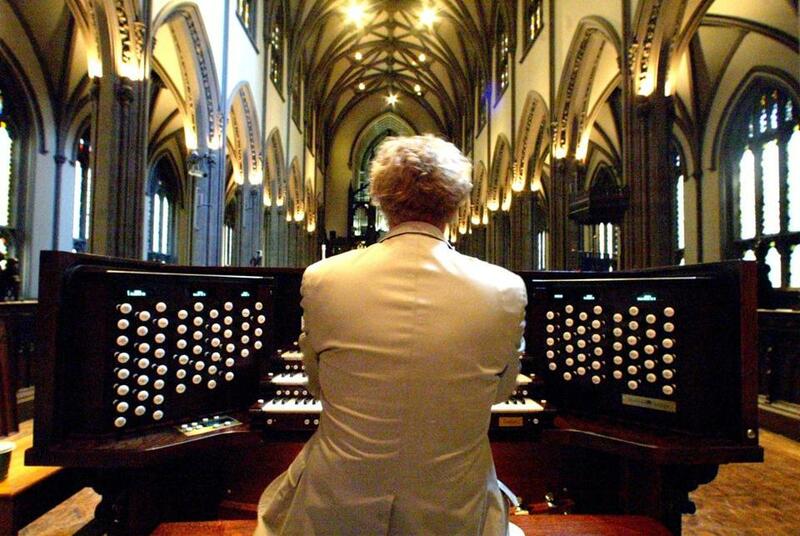 But the real object of his attention stood by the altar: Opus 10, his newly minted digital organ with four keyboards, a gleaming shell of burnished wood, and the full sonic force, filigree, and thunder of 9,000 pipes — all without a pipe to be found. Along with his business partner, David Ogletree, Marshall had been at work on the instrument for more than a year, their crew soldering components, wiring circuitry, and fine-tuning software. All told, the organ boasted more than 6 miles of wire, 72 speakers, and 18,000 watts of power. Now, as Marshall sat in St. Matthew’s 19th-century nave, their work was nearing completion: Opus 10 (the 10th instrument they’ve built together) would finally — finally! — receive its voice. Doug Marshall tuned and adjusted as he listened to the digital organ in St. Matthew's Episcopal Church in Wheeling, W.Va.
More than dreamers, Ogletree and Marshall are revolutionaries in the erudite, passionate, and proudly obscure world of organ building. From their base in Needham, Mass., they have set out to build the finest, cost-is-no-object digital organs in the world — instruments to rival in grandeur the world’s leading pipe organs. And by many accounts have succeeded, brilliantly. But their aspirations have also engendered hostility and suspicion among traditionalists, who see in their work a high-tech incursion on their aesthetic preserve. The pair’s pursuit of perfection has taken them to churches and concert halls across the country, where they’ve taped thousands of samples of pipe organ sounds for their software to summon and blend. It also had Marshall locked this day in a tense but rewarding exercise, tuning their new instrument to the church where it will live: As with all great organs, the entire building would be Opus 10’s sounding board. with clear, assertive tones flowing from St. Matthewss swell chambers to its nave of tawny wood and Tiffany glass. But Marshall was in for a rude awakening. Marshall had been camped out like this for nearly a week, “voicing” Opus 10. But whereas a traditional builder would hone an instrument’s pipes to match the room, Marshall trafficked in RAM, sound samples, and processors. 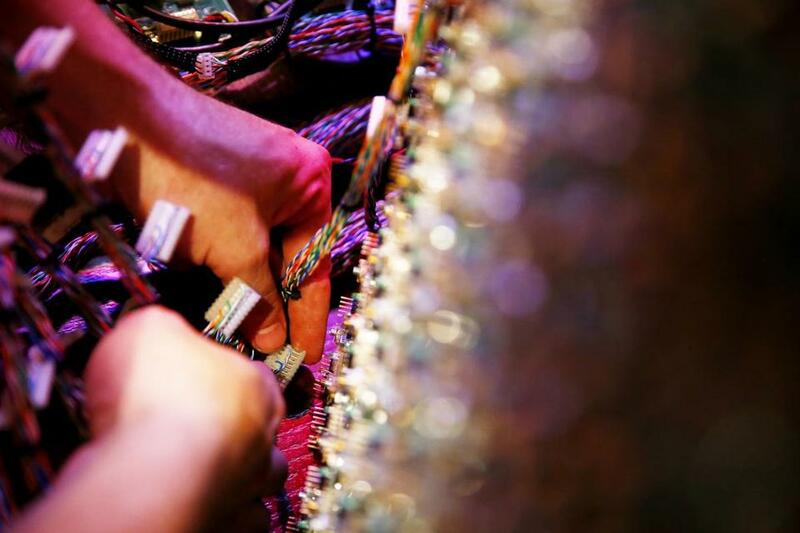 One hundred and ninety two microprocessors were installed in the digital organ in W.Va.
It’s an aspiration that doesn’t sit well with many pipe-organ aficionados, who argue that the enveloping, magisterial sound of the pipe organ can barely be approximated by even the finest digital simulacrum. Nevertheless, the Needham-based operation’s technological savvy has paid off. 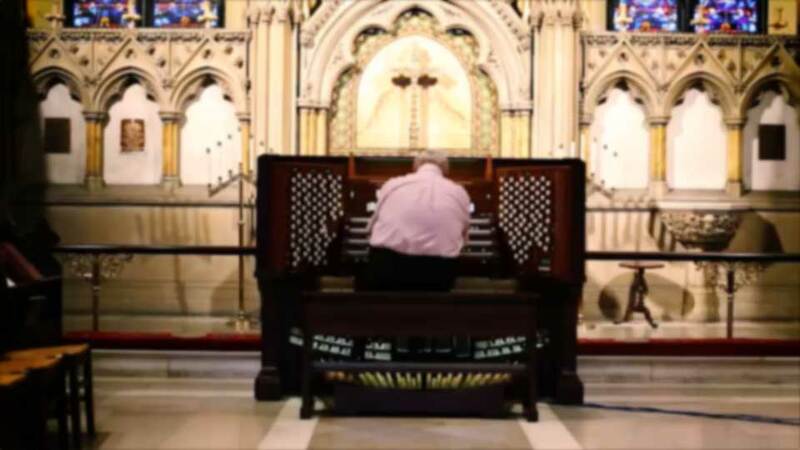 Marshall & Ogletree instruments reside in several of the country’s great churches, including New York City’s Trinity Wall Street, where the company replaced the pipe organ destroyed during the Sept. 11, 2001, terrorist attacks. It was their first creation — their Opus 1. A digital organ made by Marshall & Ogletree was installed in Trinity Church in New York on Sept. 11, 2003. Here it is played by Owen Burdick, Trinity’s former music director, at the installation. ith its Rube Goldberg network of pipes, wind, keys, and wiring, the pipe organ is perhaps the most mysterious – and majestic – of instruments. Mozart once crowned it “the king of instruments,” a nod not only to the organ’s outsized symphonic sound, but also to its titanic proportions and close, historic association with Christian worship and churches. “The architecture and instrument are one together,” said Richard Clark, music director for Saint Cecilia Parish in Boston. The complex workings of great organs also add to their otherworldly aura. For one thing, the intensity of an organ’s sound is not tied to a performer’s physical exertion. When an organist presses a key, air from a pressurized chest is released to an assigned set of pipes. Known as a “rank,” these tonally consistent sets can evoke anything from a tuba or chimes to the human voice. Rank can be laid upon rank, creating vast sound palaces that sail through the air. The instrument’s sheer size adds to its allure. Unlike a Stradivarius or Steinway, organs rarely travel. For the small but devoted group of aficionados — many of whom make pilgrimages to hear, play, and climb around the inner workings of these beloved monarchs — the idea that the pipe organ could be reduced to an iPod-friendly set of sound files, recordings drawn from instruments of traditional lineage, isn’t mere hubris: it’s anathema. Marshall played the newly completed digital organ at St. Matthew’s Episcopal Church. or the better part of two decades, Marshall and Ogletree have armed themselves with sensitive microphones and climbed into the cramped chambers that house organ pipes. They’ve captured individual pipe sounds from nearly 100 organs, later massaging each file into a usable sample. Scrolling through his computer, Marshall essentially had the entire history of the American pipe organ at his fingertips. With just a few clicks, he could enable Opus 10 to mimic instruments as varied as Wurlitzer, German Baroque, or French Romantic organs. Now — faced with that one balky tone — Marshall was looking for something specific: an F-sharp to match St. Matthew’s state trumpet, a set of pipes (or “stop”) whose sound they had captured from the church’s previous organ. Doug Marshall tunes used a keyboard and laptop from the aisle at St. Matthew's Episcopal Church in Wheeling, W. Va. Though he spends most of his time these days building instruments, Marshall was first an accomplished organist. As a young man he studied with the legendary Virgil Fox, winning the 1972 American Guild of Organists National Playing Competition. Ogletree, meanwhile, studied organ at the University of Massachusetts before earning a graduate degree from the Curtis Institute of Music in Philadelphia. 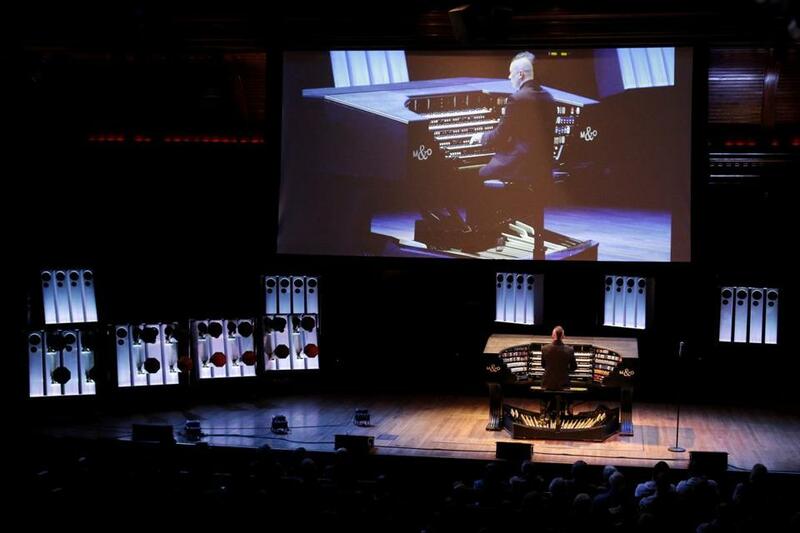 “Both are seriously heavyweight organ players,” said Cameron Carpenter, a Grammy-nominated organist who commissioned the pair to build the International Touring Organ, a portable five-keyboard instrument. Cameron Carpenter performed on his custom digital organ in Cambridge earlier this year. Still, neither Marshall nor Ogletree had any experience crafting organs when they began toying with the idea in the mid-1990s. By then, the idea of sampling individual pipes to create sounds was nothing new. But computing power was relatively modest, and many electronic organ makers would record only brief bursts of sound, which they would then loop into a continuous sample. Convinced they could do better, the pair began making voluptuous recordings that often lasted a minute or more. Marshall, meanwhile, tinkered into the night with hardware prototypes. “We knew right away when we heard it that we were on to something,” said Ogletree, 52. But with their rudimentary rig barely up and running, their passion project took on a new sense of urgency when Burdick came looking to replace the Trinity pipe organ that had been destroyed by the dust clouds at ground zero. Many of the world’s top-tier organ builders had already consulted with Burdick. Not only was Trinity one of the wealthiest churches in the country, but its choice of organ was given added weight by the church’s association with 9/11. The replacement had to be something very special. Nevertheless, Burdick’s decision to hire Marshall & Ogletree — amateur builders who had never completed an instrument — was a controversial one, decried by many in the pipe organ community. Still, the trio stuck with their plan. They would use only the best materials: solid wood-core keyboards from England, handmade consoles to rival those of the grandest pipe organs, bidirectional speakers to better fill the air. But their real innovations came under the hood, closely held technological secrets they refuse to patent or discuss. n the years since, the pair have continued to refine their work. They’re obsessive in their attention to detail, recording not only pipes, but also the rumble of the blower and the hiss of moving valves. They delight in the clicking of keys andthe gasping of pipes. Still, Ogletree concedes that there are certain perhaps irreducible differences in the aural and even physical sensation of a pipe organ’s sound, versus that of a digital instrument. But adherents like Burdick believe that in many ways, Marshall & Ogletree LLC has already arrived, its instruments filling a broad niche for many midsized churches: a world-class instrument that costs between $300,000 and $1.5 million. 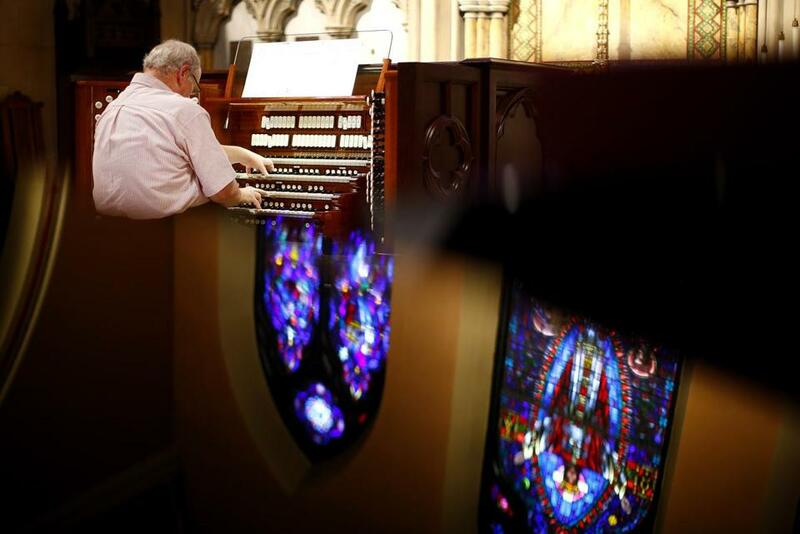 That was undoubtedly one of the considerations in West Virginia, where Robert Troeger, music director at St. Matthew’s, said church officials balked at the price of pipe organs before opting for Opus 10, which cost roughly $750,000. The quality of the instrument and the limitations of space and finances had to align, and Troeger was sure they would: He had already heard Opus 1 at Trinity.